I drove through Sheffield last week and it was great to see the railwaymen sculpture bedding in. It is almost a year since the 4.5 m long sandstone sculpture was installed in Brightside, Sheffield. The site, now owned by BMW was formerly the heart of Sheffield’s railway industry. 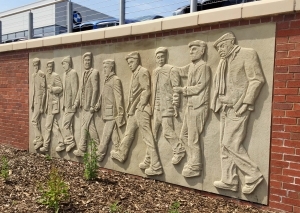 The place was once teeming with railway workers and the sculpture depicts a group of men trouping out of the railway yards at their peak time around c1900. I used metal workers, carpenters and spray painters of all ages as the models for the 9 figures, ensuring that they had the “time served” feel of men in hard industry. All are sporting their flat caps and smart but tatty work attire. The sculpture is as much about the rhythm of the figures walking as it is the relationships between the characters. The young boy, heads the group, first out of work and eager to get away, others are discussing and arguing. The figure in the centre (based on me) stares straight at the viewer and the old man brings upper the rear looking very tired. Overall, this was great fun designing the and carving the characters and it is really pleasing to see that it has settled nicely into its new home. The figures, like ghosts a reminder of times gone by and the vast change that has affected this part of the City in recent times. Worth if look if you are ever passing that way.